This series is named in honor of long-time member Betty Angulo, whose generous financial gift underwrites the presentation of three major organ concerts and musical events annually. They feature world-renowned organists and musicians and are open to the public and are free of charge. The November 5th concert is being held in honor of the 500th anniversary of the Protestant Reformation. It will feature the Wichita Chamber Chorale singing J. S. Bach's Cantata #80, "A Mighty Fortress is Our God." The text for the familiar hymn was written by Martin Luther, who on October 31, 1517, penned a document. His “95 Theses." The Chorale will also sing a few familiar anthems and hymns. 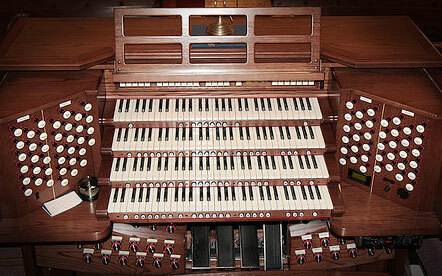 The Reuter pipe organ and four-manual custom Rodgers console will also be featured. The concert is being underwritten by First Presbyterian's Angulo Organ Concert series and the Wichita Chapter of the American Guild of Organists. Admission is free to the public. The concert begins at 3:00 PM and should last about an hour.